Designed to display two 8-1/2" x 11" graphic panels. 1/8" thick laser cut clear acrylic construction. Made from a single piece of acrylic. These acrylic image fixtures, dual sign holders, which are specifically made for our wire suspension kits, feature a design that is constructed from one piece of plastic. The simple fabrication of these units helps to keep the cost down. These dual sign holders have the ability to display to magazines next to each other without having to use sign clamps between the flyers. This feature means that less cables and clips will be used, which also lowers your cost. The dual sign holders are easy to install and simple to use. 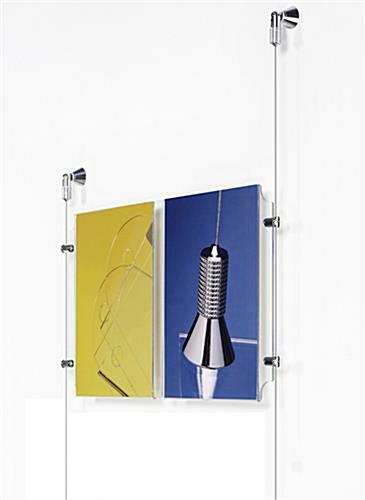 The wire suspension units are great for displaying graphics in an office or lobby setting. 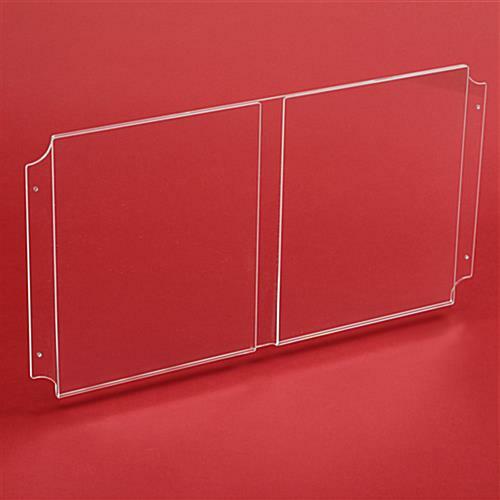 The dual sign holders are made of 1/8" acrylic and are precision cut with a laser. There are holes that are placed in each corner of the fixture for use with side clamps. 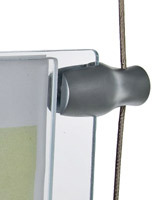 The dual sign holders can use clips that are compatible with our cable systems for mounting the plastic fixtures. The graphics are changed in these slots by simply sliding images in and out of the containers. 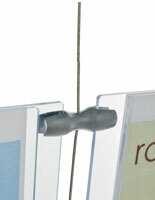 The dual sign holders measure 20" wide x 11" high x 1/4" deep and are made to hold flyers that are 8-1/2" wide x 11" high. The side clamps discussed herein have to be purchased separately as they do not come with the plastic fixtures. Plastic sleeve only. Mounting hardware and cable not inlcuded. 20.0" x 11.0" x 0.25"